The post only looks at one station in isolation, and does not reference original source of the claims. Paul Homewood at notalotofpeopleknowthat looked at all three available rural stations in Paraguay. The data from Mariscal and San Jan Buatista/Misiones had the same pattern of homogenization adjustments as Puerto Casado. That is, cooling of the past, so that instead of the raw data showing the 1960s being warmer than today, it was cooler. Homogenization of data means correcting for biases. For a 580,000 sq mile area of Central South America it would appears strong adjustment biases to have been introduced in a single direction. My comment did not contain the hyperlinks or italics. It has been deleted without passing through moderation. The only bit of the moderation policy I believe that I fall foul of is the last. This blog is also turning out to be both more time consuming and more stressful than anticipated. Some moderation may be based purely on whether or not I/we can face dealing with how a particular comment thread is evolving. This is not a public service and so, in general, any moderation decision is final. If you look again at the information for this station the trend before adjustments was -1.37oC per century, after quality control it was -0.89 oC per century, and after adjusting for the station moves was +1.36 oC per century. Also, if you consider the same region for the same months, the trend is +1.37 oC per century, and for the country for the same months it is +1.28 oC per century. So, not only can one justify the adjustments, the result of the adjustments is consistent with what would be expected for that region and for the country. Paul Homewood has investigated all the other stations in Paraguay or in neighbouring Bolivia and found similar ad hoc adjustments. It completely undermines ATTP’s arguments. This anonymous individual is wrong. Rather than face dealing that he is wrong, ATTP has deleted my comment. He is entitled to his beliefs, and in a free society can proselytize to his heart’s content. But there are boundaries. One of them is in suppressing evidence that undermines the justification for costly and harmful public policies. That is policies that are harming the poor here in Britain, but (and more importantly) can only be remotely successful by destroying the prospect of increasing living standards for over half the world’s population. Paul Homewood and others are increasingly uncovering similar biases in the temperature record in other parts of the world. The underlying data for the global surface temperature sets is in need of a proper, independent audit, to determine the extent of the biases within it. But when the accusation that the Paraguayan temperature data set is corrupted, people will point to ATTP’s blog post as evidence that there is but a single instance, and that instance has been debunked. Another boundary is a value that that many in the criminal justice system also hold dear. The more emotive the subject, the greater all concerned must go out of their way to compare and contrast the arguments. That way, the influence of our very human prejudices will be minimized. Again, independent audits will help eliminate this. If ATTP thinks he has all the answers then he will not be afraid to encourage people to look at both sides, evaluate by independent standards, and make up their own minds. This will be added to when I get time. I have invited a response from ATTP, by posting #comment-46021. You have deleted two of my comments in the last 24 hours that meet all of your moderation criteria except one – that you cannot face dealing with a challenge. That is your prerogative. However, the first comment, (now posted on my blog) I believe completely undermines your argument. 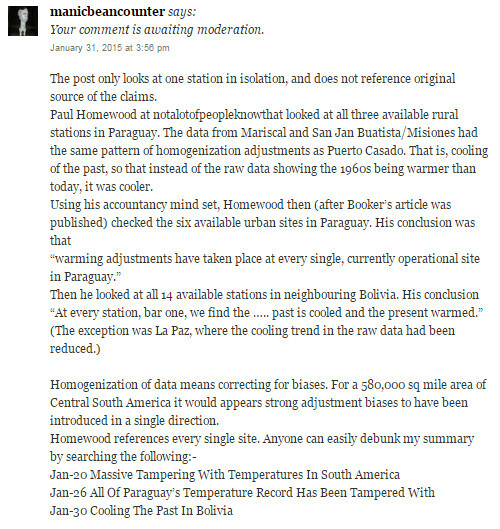 Paul Homewood has shown that the Puerto Casado dataset homogenization did not make it consistent with neighbouring non-homogenized surface temperature stations, but that all the Paraguayan and neighbouring Bolivian surface temperature stations were “homogenized” in the same way. That is, rather than eliminating the biases that local factors can create, the homogenizations, by people far removed from the local situations, effectively corrupted the data set, in a way that fits reality to the data. I might be wrong in this. But based on your arguments so far I believe that my analysis is better than yours. I also believe that who has the better argument will only be resolved by an independent audit of the adjustments. If you are on the side of truth you would welcome that, just as a prosecutor would welcome the chance to prove their case in court, or a pharmaceutical company would welcome independent testing of their new wonder-drug that could save millions of lives. Even if I am wrong, I will be glad at being refuted by superior arguments, as I will know that to refute my claims will require you to up your game. Humanity will be served by my challenging a weak case and making it stronger. You have generated over 500 comments to your post, so an appeal for help via email should generate some response. If that does not work there are many well-funded organisations that I am sure will rush to your assistance. There are at least seven options I think you can take. Ignore me, and pretend nothing has happened. Bad idea. I will start analysing your posts, as you did with Wattsupwiththat, only rather than your pea-shooters firing blanks, I have the heavy artillery with HE shells. Do an attack post – like desmogblog or Bob Ward of the Grantham Institute might do. Bad idea, I will take that as perverting or suppressing the evidence, and things will get rather rough. After all, I am but a (slightly) manic ex-beancounter, and you have the consensus of science on your side, so why is should sending in the PR thugs be necessary unless you are on the losing side? Get together a response that genuinely ups the game. Win or lose you will have served humanity as I and others will have to rebut you. Engage and all will gain through greater understanding. Admit that there are other valid points of view. A start would be to release this comment, which will get posted on my blog anyway. I quite accept that you cannot come up with a rebuttal at the drop-of-a-hat. A simple comment that a response will be made sometime this year is fine by me. Also call for a truly independent audit of the surface temperature set. It could be for your own reasons, and if truly independent, I will support it. If a whitewash, like the enquiries that Gordon Brown ordered into Climategate, an audit will do more harm than good. Close down your blog and do something else instead. You choose to be anonymous, and I respect that. Walking away is easy. Admit that you got this one wrong. You will take some flack, but not from me. On the 28th January 2015, the DECC launched a new policy emissions tool, so everyone can design policies to save the world from dangerous climate change. I thought I would try it out. By simply changing the parameters one-by-one, I found that the model is both massively over-sensitive to small changes in input parameters and is based on British data. From the model, it is possible to entirely eliminate CO2 emissions by 2100 by a combination of three things – reducing the percentage travel in urban areas by car from 43% to 29%; reducing the average size of homes to 95m2 from 110m2 today; and for everyone to go vegetarian. Cutting carbon emissions to limit global temperatures to a 2°C rise can be achieved while improving living standards, a new online tool shows. The world can eat well, travel more, live in more comfortable homes, and meet international carbon reduction commitments according to the Global Calculator tool, a project led by the UK’s Department of Energy and Climate Change and co-funded by Climate-KIC. Built in collaboration with a number of international organisations from US, China, India and Europe, the calculator is an interactive tool for businesses, NGOs and governments to consider the options for cutting carbon emissions and the trade-offs for energy and land use to 2050. “For the first time this Global Calculator shows that everyone in the world can prosper while limiting global temperature rises to 2°C, preventing the most serious impacts of climate change. “Yet the calculator is also very clear that we must act now to change how we use and generate energy and how we use our land if we are going to achieve this green growth. Upon entering the calculator I was presented with some default settings. Starting from a baseline emissions in 2011 of 49.9 GT/CO2e, this would give predicted emissions of 48.5 GT/CO2e in 2050 and 47.9 GT/CO2e in 2100 – virtually unchanged. Cumulative emissions to 2100 would be 5248 GT/CO2e, compared with 3010 GT/CO2e target to give a 50% chance of limiting warming to a 2°C rise. So the game is on to save the world. I only dealt with the TRAVEL, HOMES and DIET sections on the left. I went through each of the parameters, noting the results and then resetting back to the baseline. The TRAVEL section seems to be based on British data, and concentrated on urban people. Extrapolating for the rest of the world seems a bit of a stretch, particularly when over 80% of the world is poorer. I was struck first by changing the mode of travel. If car usage in urban areas fell from 43% to 29%, global emissions from all sources in 2050 would be 13% lower. If car usage in urban areas increased from 43% to 65%, global emissions from all sources in 2050 would be 7% higher. The proportions are wrong (-14% gives -13%, but +22% gives +7%) along with urban travel being too high a proportion of global emissions. The HOMES section has similar anomalies. Reducing the average home area by 2050 to 95m2 from 110m2 today reduces total global emissions in 2050 by 20%. Independently decreasing average urban house temperature in 2050 from 17oC in Winter & 27oC in Summer, instead of 20oC & 24oC reduces total global emissions in 2050 by 7%. Both seem to be based on British-based data, and highly implausible in a global context. In the DIET section things get really silly. Cutting the average calorie consumption globally by 10% reduces total global emissions in 2050 by 7%. I never realised that saving the planet required some literal belt tightening. Then we move onto meat consumption. The baseline for 2050 is 220 Kcal per person per day, against the current European average of 281 Kcal. Reducing that to 14 Kcal reduces global emissions from all sources in 2050 by 73%. Alternatively, plugging in the “worst case” 281 Kcal, increases global emissions from all sources in 2050 by 71%. That is, if the world becomes as carnivorous in 2050 as the average European in 2011, global emissions from all sources at 82.7 GT/CO2e will be over six times higher the 13.0 GT/CO2e. For comparison, OECD and Chinese emissions from fossil fuels in 2013 were respectively 10.7 and 10.0 GT/CO2e. It seems it will be nut cutlets all round at the climate talks in Paris later this year. No need for China, India and Germany to scrap all their shiny new coal-fired power stations. Below is the before and after of the increase in meat consumption. Things get really interesting if I take the three most sensitive, yet independent, scenarios together. That is, reducing urban car use from 43% to 29% of journeys in 2050; reducing the average home area by 2050 to 95m2 from 110m2; and effectively making a sirloin steak (medium rare) and venison in redcurrant sauce things of the past. Adding them together gives global emissions of -2.8 GT/CO2e in 2050 and -7.1 GT/CO2e in 2100, with cumulative emissions to 2100 of 2111 GT/CO2e. The model does have some combination effect. It gives global emissions of 3.2 GT/CO2e in 2050 and -0.2 GT/CO2e in 2100, with cumulative emissions to 2100 of 2453 GT/CO2e. Below is the screenshot of the combined elements, along with a full table of my results. It might be great to laugh at the DECC for not sense-checking the outputs of its glitzy bit of software. But it concerns me that it is more than likely the same people who are responsible for this nonsense are also responsible for the glossy plans to cut Britain’s emissions by 80% by 2050 without destroying hundreds of thousands of jobs; eviscerating the countryside; and reducing living standards, especially of the poor. Independent and critical review and audit of DECC output is long overdue. A spreadsheet model is also available, but I used the online tool, with its’ excellent graphics. The calculator is built by a number of organisations. There is a huge build-up underway for the COP21 climate conference to be staged in Paris in November. Many countries and NGOs are pushing for an agreement that will constrain warming to just 2oC, but there are no publicly available figures of what this means for all the countries of the world. This is the gap I seek close with a series of posts. The first post is concerned with getting a perspective on global emissions and the UNIPCC targets. In what follows, all the actual figures are obtained from three primary sources. Emissions data comes from the Carbon Dioxide Information Analysis Centre or CDIAC. Population data comes from the World Bank, though a few countries are missing. These are mostly from Wikipedia. The Emissions targets can be found in the Presentation for the UNIPCC AR5 Synthesis Report. All categorizations and forecast estimates are my own. A starting point for emissions reductions is to stabilize emissions to 1990 levels, around the time that climate mitigation was first proposed. To illustrate the composition emissions I have divided the countries of the world into the major groups meaningful at that time – roughly into First World developed nations, the Second World developed communist countries and the Third World developing economies. The First World is represented by the OECD. I have only included members in 1990, with the USA split off. The Second World is the Ex-Warsaw pact countries, with the countries of the former Yugoslavia included as well. The rest are of the world is divided into five groups. I have charted the emissions per capita against the populations of these groups to come up with the following graph. In rough terms, one quarter of the global population accounted for two-thirds of global emissions. A major reduction on total emissions could therefore be achieved by these rich countries taking on the burden of emissions reductions, and the other countries not increasing their emissions, or keeping growth to a minimum. I have created a forecast of both emissions and population for 2020 using the data up to 2013 for both emissions and population. Mostly these are assuming the same change in the next seven years as the last. For emissions in the rapidly-growing countries this might be an understatement. For China and India I have done separate forecasts based on their emissions commitments. This gives the following graph. The picture has changed dramatically. Population has increased by 2.4 billion or 45% and emissions by over 80%. Global average emissions per capita have increased from 4.1 to 5.2t/CO2 per capita. Due to the population increase, to return global emissions to 1990 levels would mean reducing average emissions per capita to 2.85t/CO2. The composition of emissions has been even more dramatic. The former First and Second World countries will see a slight fall in emissions from 14.9 to 14.0 billion tonnes of CO2 and the global share will have reduced from 68% to 36%. Although total population will have increased on 1990, the slower growth than elsewhere means the share of global population has shrunk to just 19%. China will have a similar population and with forecast emissions of 13.1 billion tonnes of CO2, 33% of the global total. The baseline is 2011, when global emissions were 29.74 billion t/CO2. In 2050 global population will be nearly nine billion. This gives an upper limit of 2.2 t/CO2 per capita and lower limit of 1.1 t/CO2 per capita. To put this in another perspective, consider the proportions of people living in countries that need emissions targets based on greater than 2.2t/CO2 emissions per capita. In 1990, it was just a third of the global population. In 2020 it will be three quarters. No longer can an agreement on constraining global CO2 emissions be limited to a few countries. It needs to be truly global. The only area that meets the target is Africa, but even here the countries of Algeria, Egypt, Libya, Tunisia and South Africa would need to have emission reduction targets. What permutations are possible if other moral considerations are taken into account, like the developed countries bear the burden of emission cuts? What targets should be set for non-fossil fuel emissions, such as from Agriculture? Are these easier or harder to achieve than for fossil fuels? What does meeting emission targets mean for different types of economies? For instance are emission reductions more burdensome for the fast-growing emerging economies that for the developed economies? What are the measures that IPCC claims exist to reduce emissions? Are they more onerous than the consequences of climate change? Are there in place measures to support the states dependent on the production of fossil fuels? In particular, the loss of income to the Gulf States from leaving oil in the ground may further destabilize the area. What sanctions if some countries refuse to sign up to an agreement, or are politically unable to implement an agreement? What penalties will be imposed if countries fail to abide by the agreements made? The blog “the eco experts“, has produced a map of the countries most likely to survive climate change. The most populous country with a high risk is India. In fact it has more people than the 50+ nations of Africa, or nearly twice the population of the OECD – the rich nations club. It is determined not to constrain the rapid growth in emissions if it means sacrificing the rapid economic growth that is pulling people out of poverty. Is this sensible when rapidly increasing its emissions create the prospect of dangerous climate change? Look at the pattern of vulnerability. Why is Mongolia more vulnerable than Russia or China? Why is Haiti more vulnerable than Guatemala & El Salvador, which in turn are more vulnerable than Mexico, which in turn is more vulnerable than the USA? Why are Syria and Iraq more vulnerable than Iran, which in turn is more vulnerable than Saudi Arabia, which is in turn more vulnerable than the UAE? Why is Madagascar more vulnerable than Tanzania, which in turn is more vulnerable than South Africa, which is in turn more vulnerable than Botswana? The answer does not lie in the local climate system but in the level of economic development. As with natural extreme weather events, any adverse consequences of climate change will impact on the poorest disproportionately. Agree to sacrifice economic growth to constrain emissions, having a significant impact on global emissions and maybe encouraging others to do likewise? Continue with the high economic growth (and hence emission growth) strategy knowing that if catastrophic climate change is real the population will be better able to cope with it, and if inconsequential they will have sacrificed future generations to a trivial problem? Continue with the high economic growth (and hence emission growth) strategy and invest in more accurately identifying the nature and extent of climate change? Now consider that any Government should be first and foremost responsible for the people of that country. If that can be best progressed by international agreements (such as in trade and keeping global peace) then it is the interests of that country to enter those agreements, and encourage other nations to do likewise. Global peace and globalisation are win-win strategies. But climate change is fundamentally different. It is a prospective future problem, the prospective harms from which are here clearly linked to stage of economic development. Combating the future problem means incurring costs, the biggest of which is economic growth. Technologically, there low-cost solutions are in place, and there is no example of any country aggressively weeding out ineffectual policies. Even if there were effective policies in in theory, for costs to exceed benefits would mean every major country either drastically cutting emissions (e.g. the OECD, China, Russia, Saudi Arabia, South Africa) or drastically constraining future emissions growth (India, Brazil, Indonesia, Vietnam, Thailand, plus dozens of other countries). If some countries fail to sign up then policy countries will be burdened with the certain actual costs of policy AND any residual possible costs of policy. Responsible countries will duck the issue, and, behind the scenes, help scupper the climate talks in Paris 2015.